Wait, six pictures do not constitute a sufficient welcome to this place! 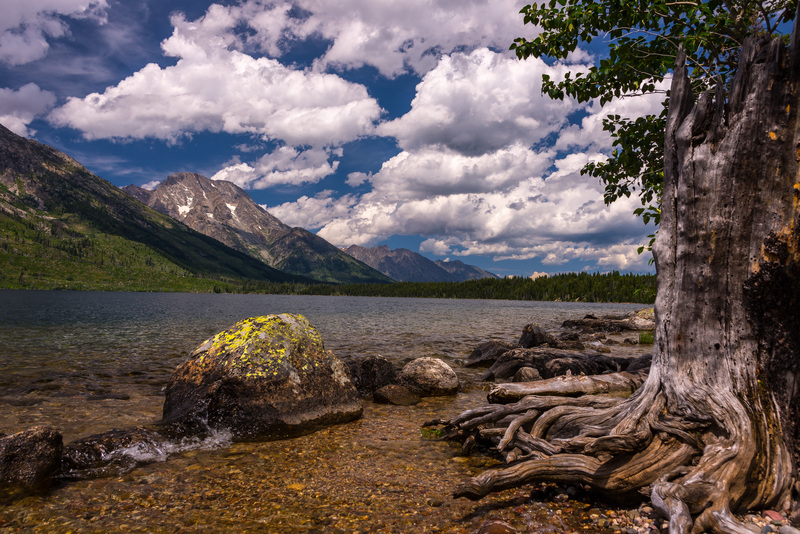 There’s Jenny Lake to explore…. 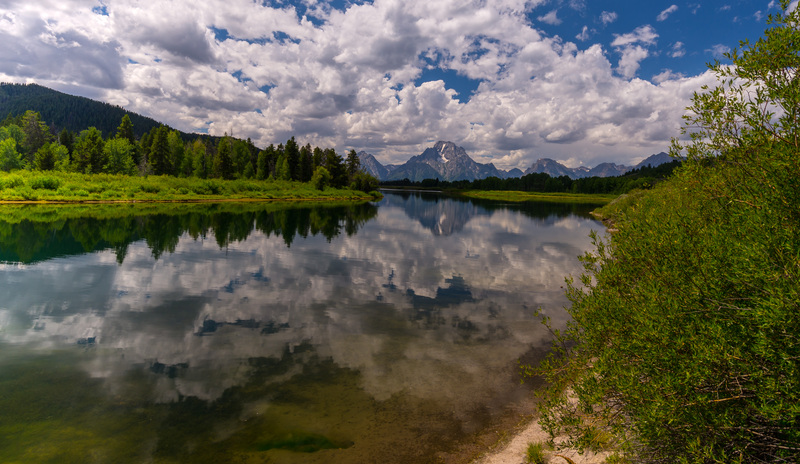 There’s the long view from Oxbow Bend…. There’s the up-close, short view…from dozens of spots…. 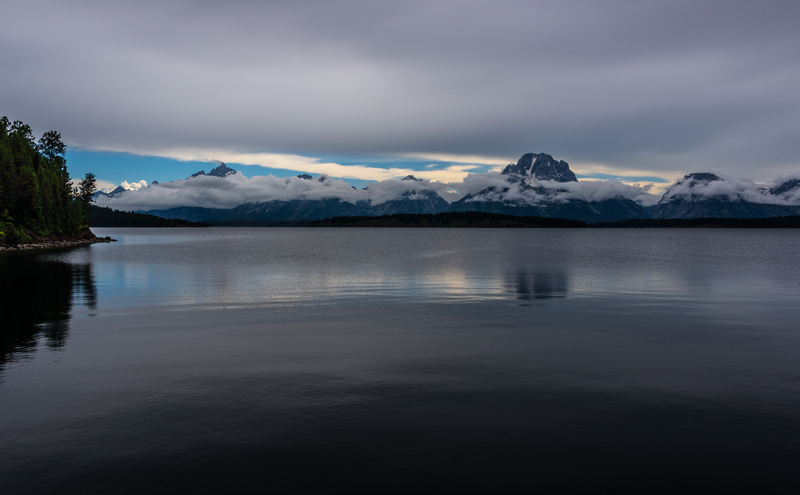 You’ve gotta go back to Jackson Lake when the clouds try to take over the mountains…. 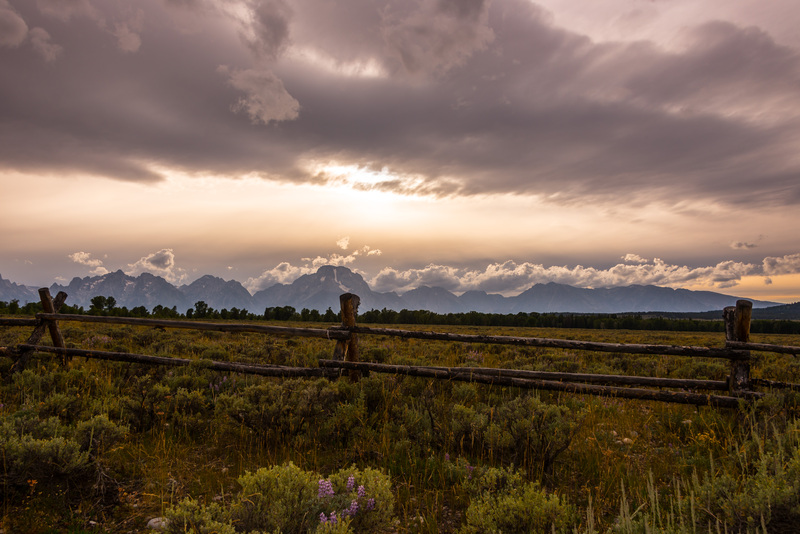 And the view when a storm threatens near sunset…is to die for! Yep, I think we’re really gonna like this place! 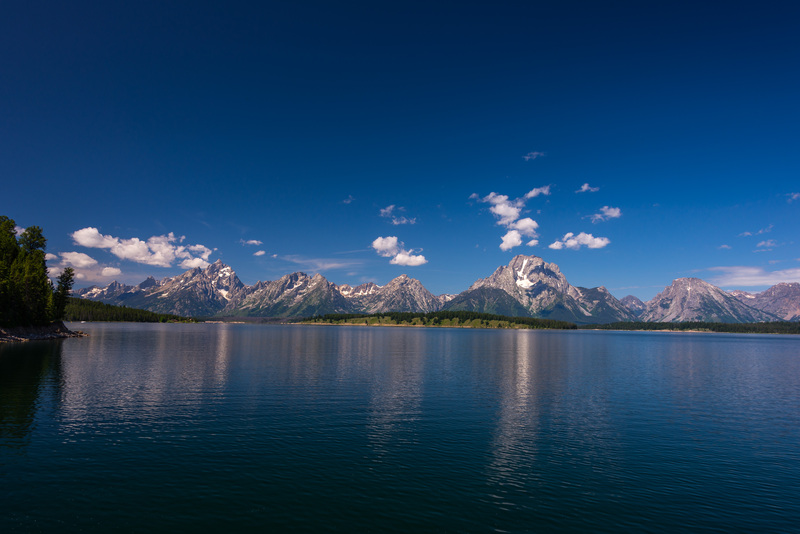 Our only other trip to Grand Teton National Park was for 2 days almost exactly 5 years ago. That visit was, in fact, one of the reasons we decided to sell our house and live in the Big Taxi…so you know we had to come back! 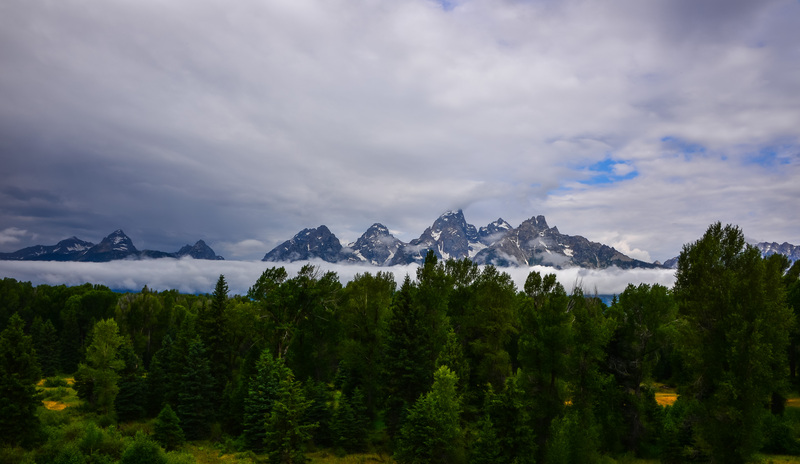 See those really Grand Tetons…. 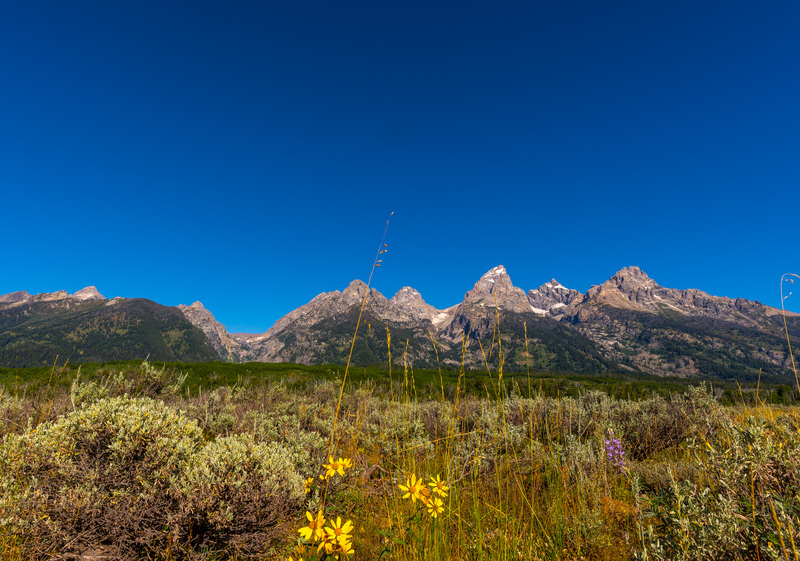 I mean see those really Grand Tetons up close…. For years, I had seen some iconic photos taken in this park, and I wanted to try my hand…and lens…at recreating them. 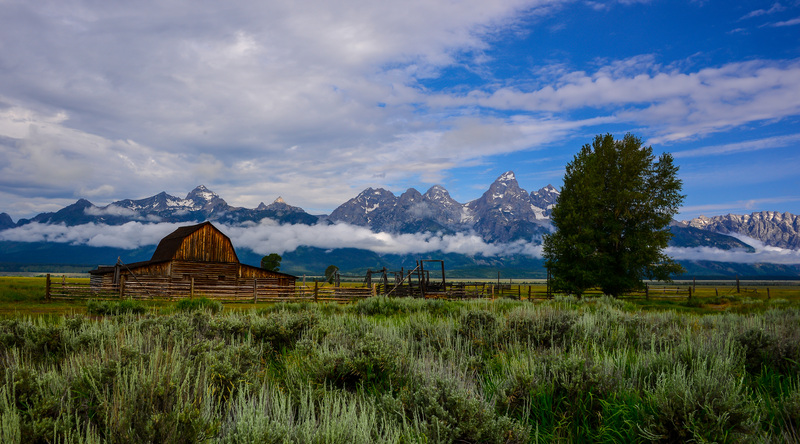 One was a Moulton Ranch barn…. 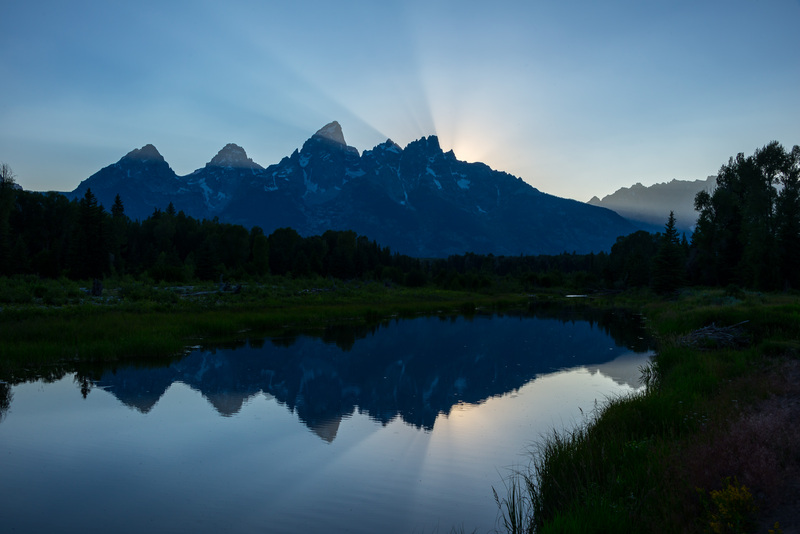 Another was using one of several reflecting ponds at Schwabachers Landing to capture a reflection of those Grand Tetons…. 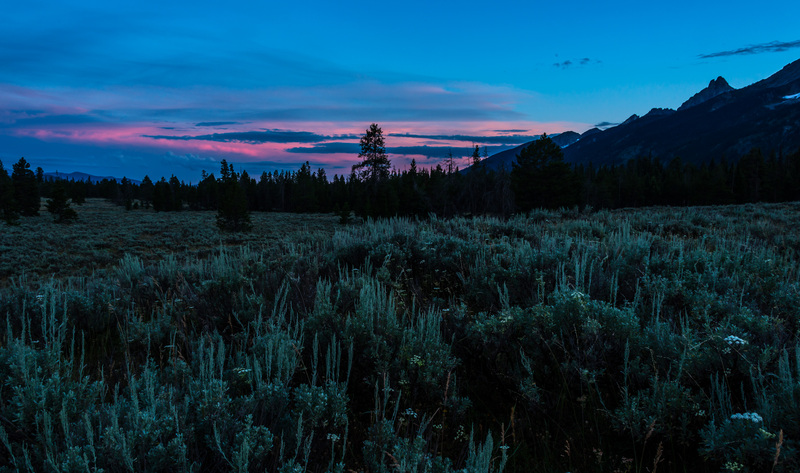 Of course, wherever we go, enjoying the local flavor of sunset is a must…. Oh well, might as well move on…. HA, not to worry, we plan to spend every second of an entire month right here…we want to soak up everything about this place! 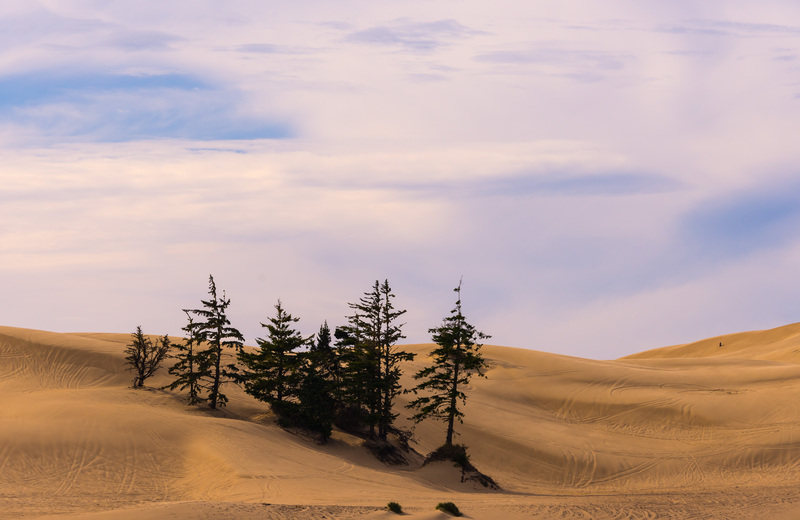 After 5 weeks along the coast of Oregon, we have made the wheels on the bus go round and round…more on that later. 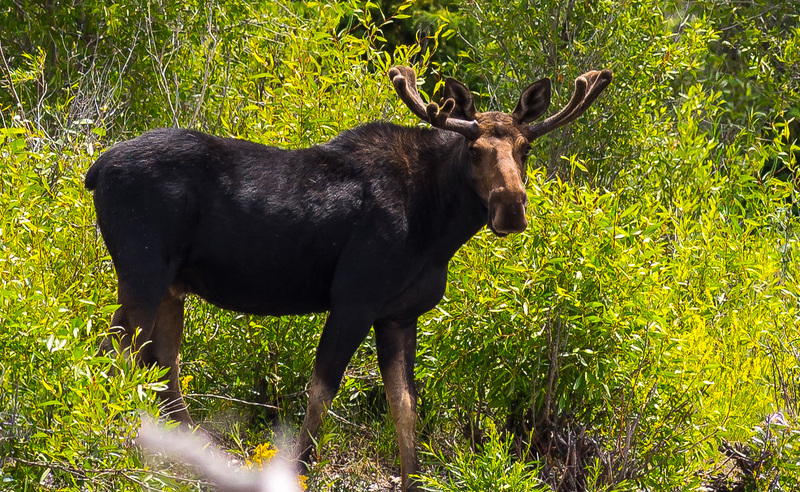 We certainly left with some of the most vibrant and stimulating scenery fresh in our minds! 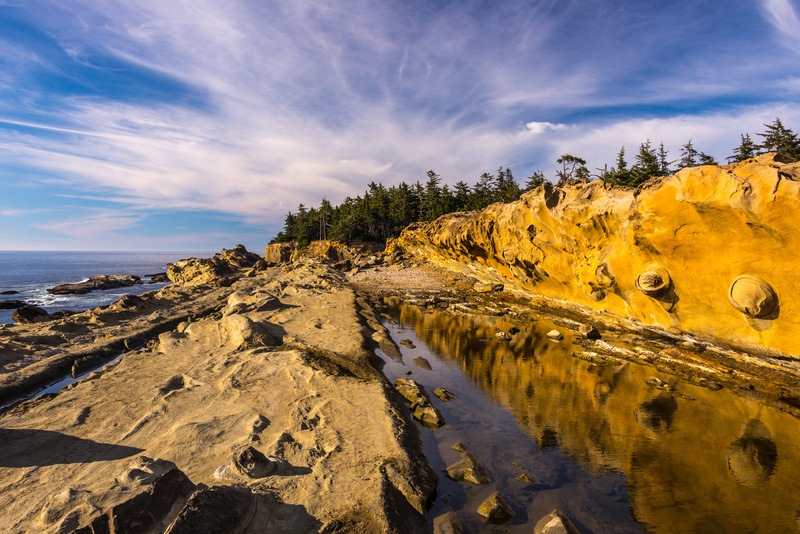 These photos are all from the last few yards of Cape Arago….we thought seeing them was worth every second of the drive to get there! I hope you click on each one…to see the amazing details this spot provides everywhere you look at every minute of the day! 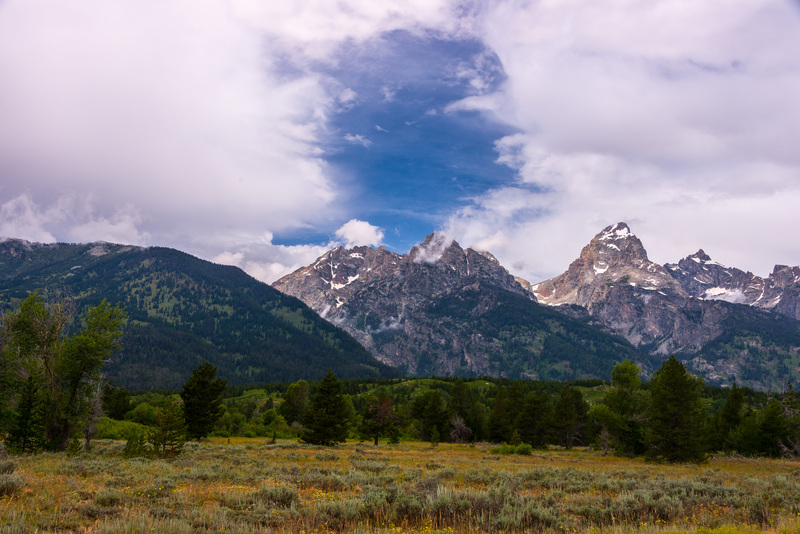 Next stop: the Big Taxi has taken us to Grand Teton National Park…for a month! We can’t wait to see everything the place has to show us…and to share it all with you! 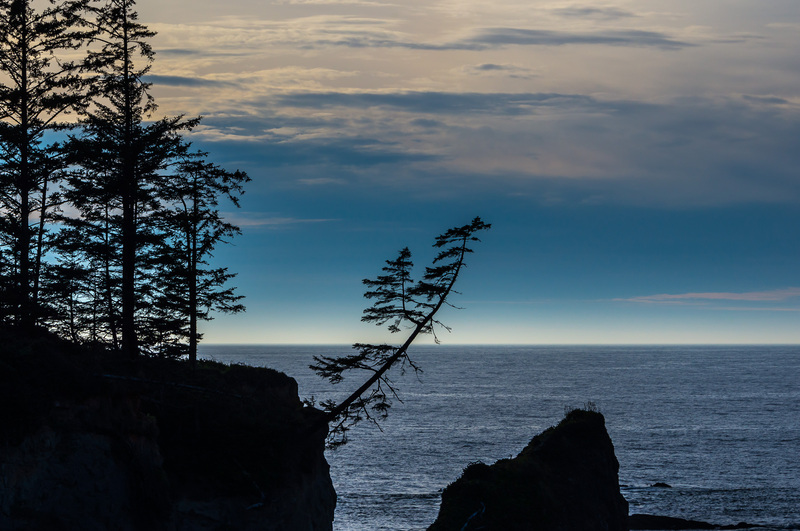 In several bays along the peninsula leading to Cape Arago, Oregon, I found trees that demonstrated real commitment to life. I hope you will click on each picture to display some beautiful details. This little one stood alone at the end of a tall wall that knifed into the bay. The limbs behind it seemed to be reaching out to beckon it back to safety. This old one showed a keen spirit. Clearly, it’s possible to defy the odds…and defy gravity…and lead a long life. Besides, who wants to stand up straight in a line like everyone else? 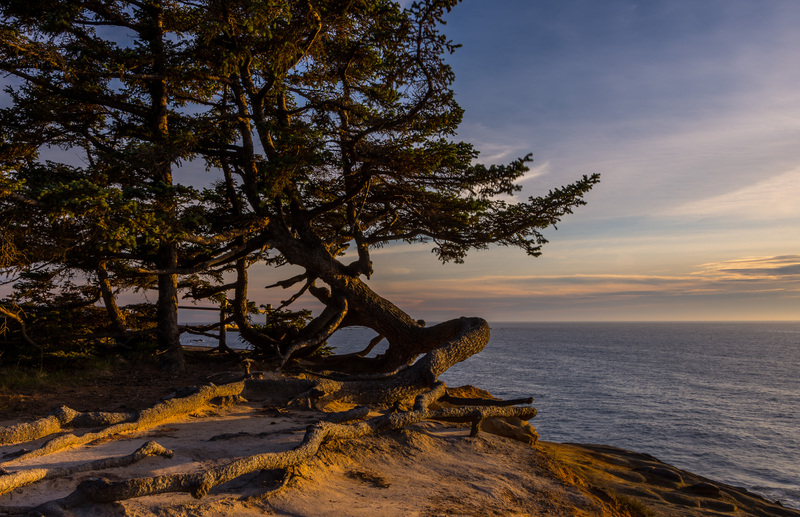 Finally, this remarkable tree stood at the end of land and showed the effects of daily battles with winds, rain, and waves. It’s tempting to call it “confused”, but I think “grasping” is more true. 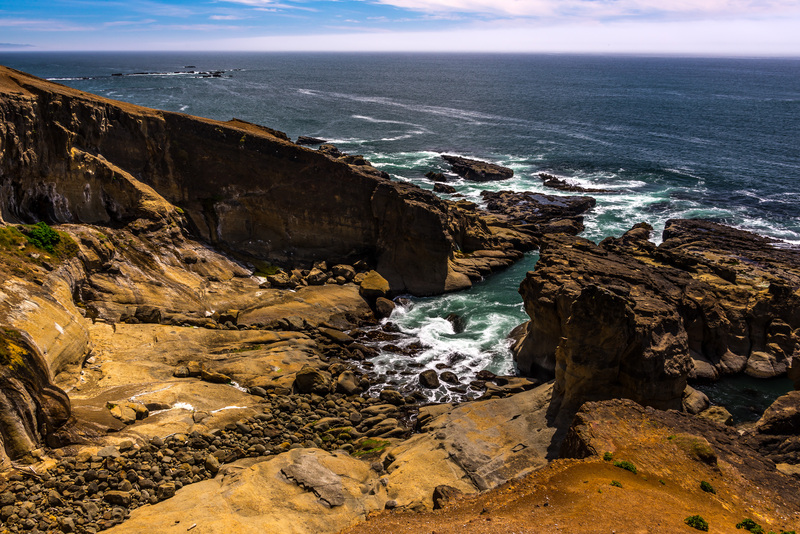 This headland forms a high, steep bluff above the ocean about 2 miles south of Yachats, Oregon. The cape was named by Captain James Cook on March 7, 1778 as he searched for the Pacific entrance to a Northwest Passage. 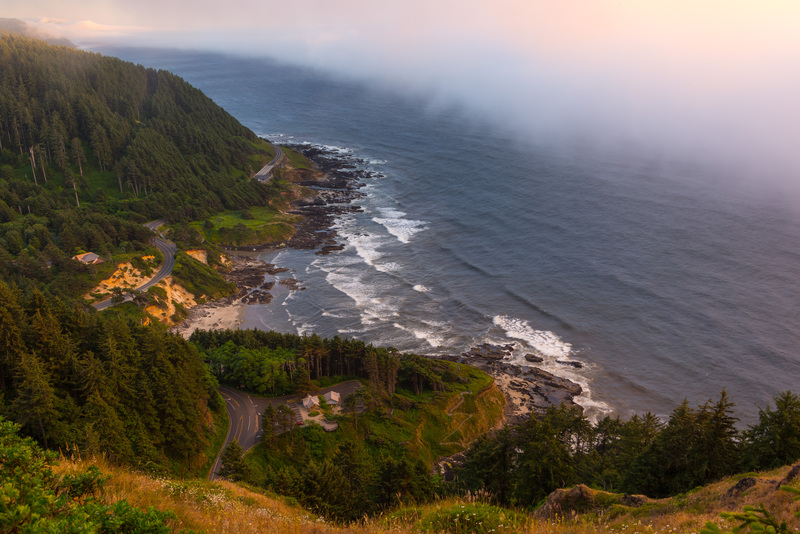 He named the cape Perpetua because it was sighted on St. Perpetua’s Day. 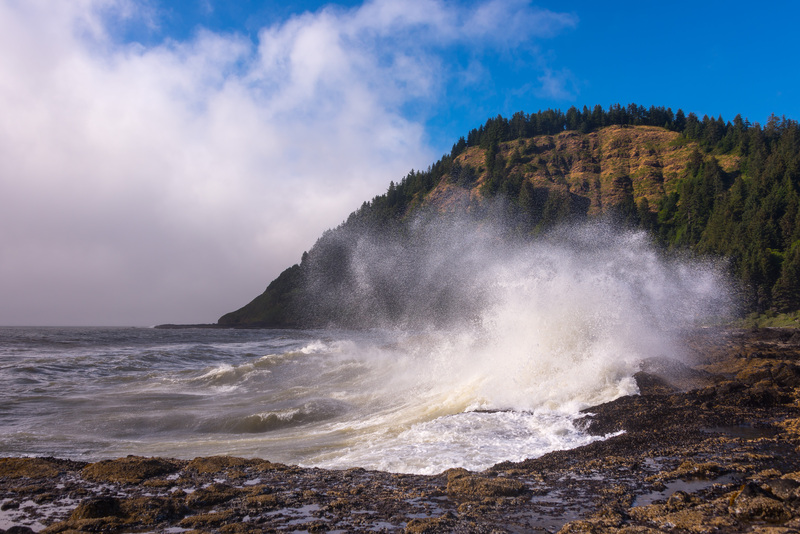 We visited this area several times, and always found it to be much more windy than other nearby areas of the coastline. 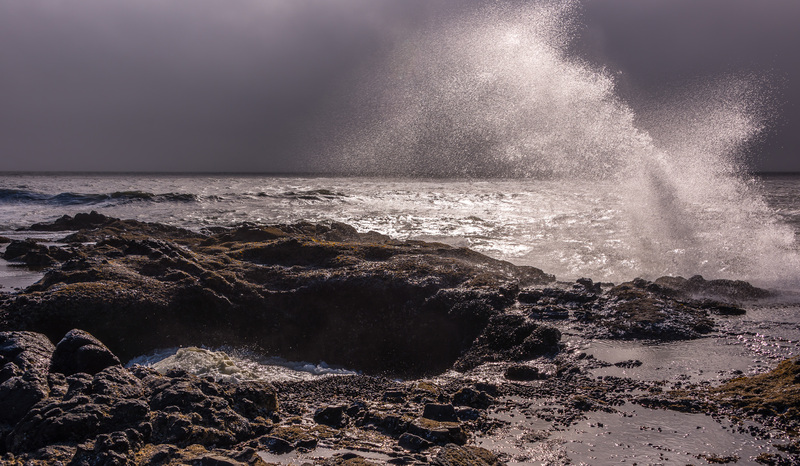 Its rock formations in the inter-tidal zone were also more dramatic than most nearby areas…and they generated more dramatic wave actions. In the first photo above, if you click on it so it fills your screen, you can see a number of slots in the dark rock that extends into the water. These funnel water into ever-narrowing channels that cause the wave to explode when it finally reaches the end. My interest in this area arose several years before we saw it. I had heard of an interesting formation named Thor’s Well, and was dying to photograph it. I previously showed you a very poor photo of it, gotten under terribly windy conditions that coated my camera and lens with salt spray and caused waves that threatened my existence. On this occasion, as you can see in the photos above, there was a lovely sunny day to welcome us. Well, not exactly. Notice in those photos how there’s quite a dense fog offshore? And that wave in the photo above wasn’t a fluke. 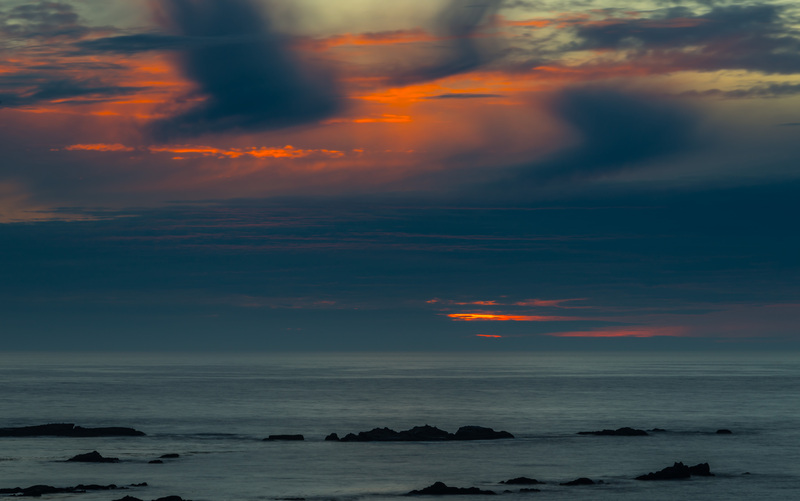 Nope, there was quite a storm coming straight onto shore, and my chance to shoot Thor’s Well was brief. I realize you can see the pictures below, but let me explain just a little before you pay them close attention! Thor’s Well is a hole in the rocks about 10 feet across just a couple feet back from the edge. Near high tide, waves will wash into it, and will disappear down its throat. 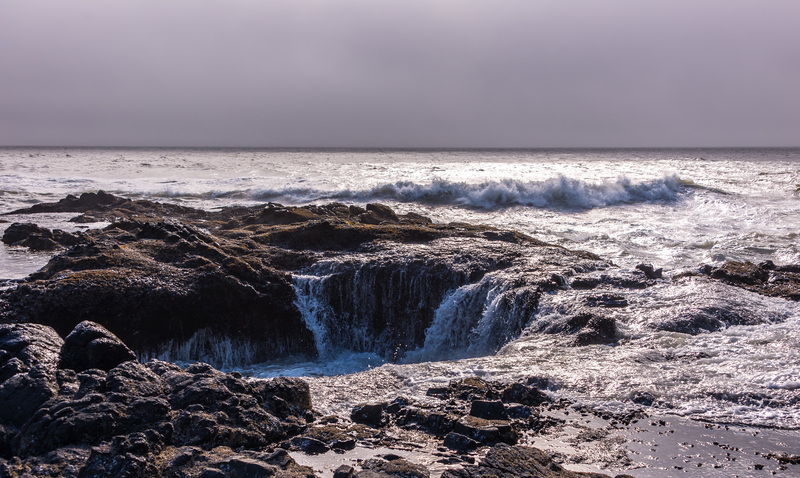 If surges in the ocean are timed just right, they will push water up from inside Thor’s Well, but it all immediately disappears down that throat. On this occasion, we were there about an hour before high tide…and I wanted to stick around to see just how dramatic it could get! But that storm wasn’t about to wait, and I was risking my camera to salt spray even so! Herewith, then, my two very modest efforts to show you what Thor’s Well looks like and acts like. 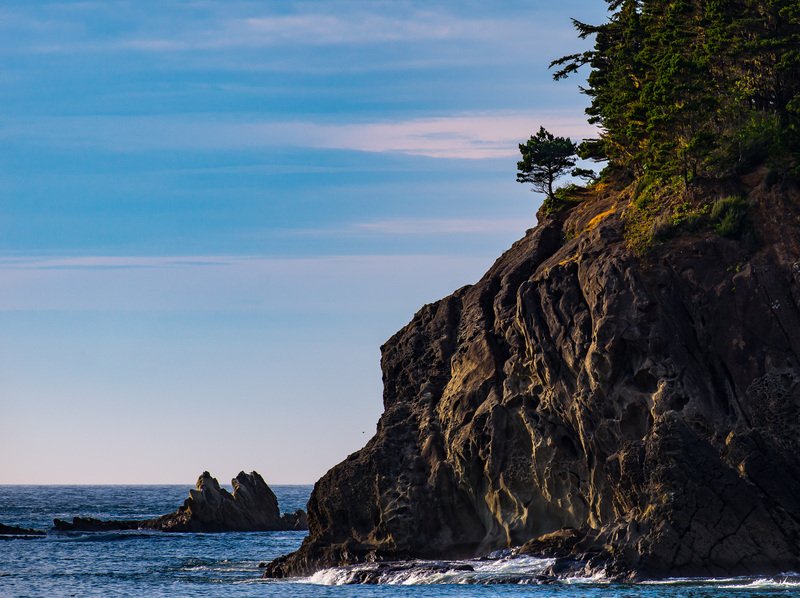 We finally moved south from Tillamook…after a month of great tours up and down the coast, and great evening meals numerous times every week at Grandma Barb’s! 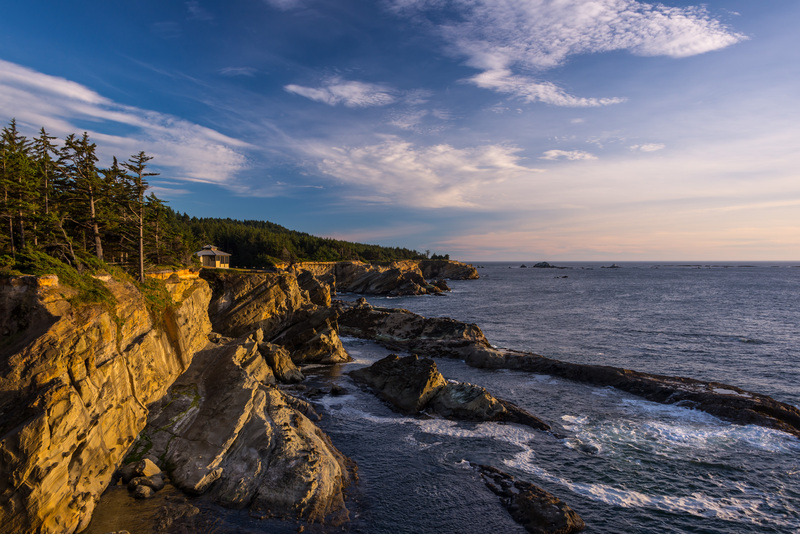 We parked for a week in Winchester Bay…actually on a peninsula in the bay, and just blocks from the Umpqua River Lighthouse. 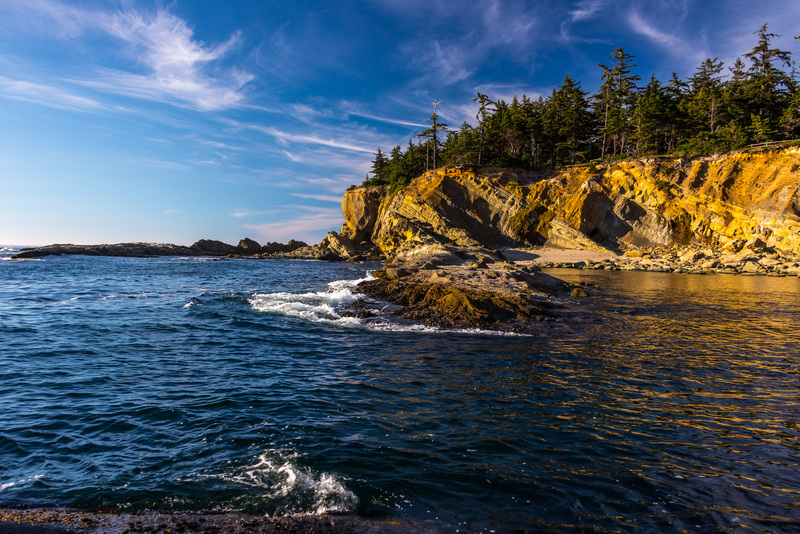 Our most favorite destination from this location was the Coos Bay area. 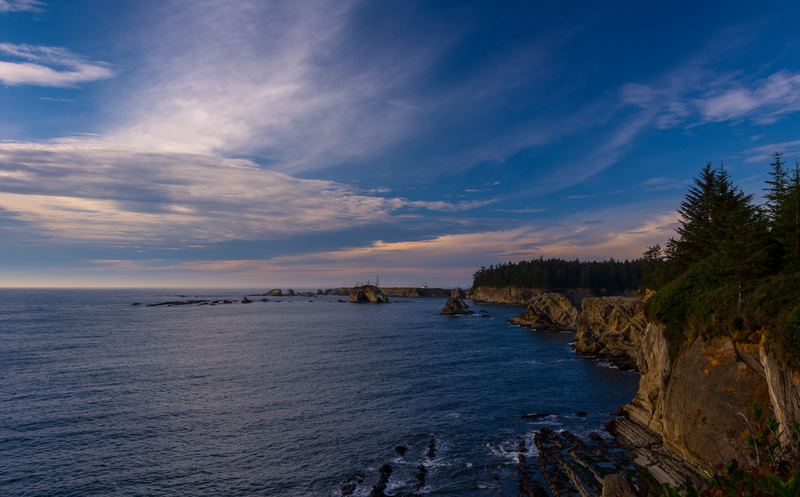 Specifically, the coastline from the south opening of the Bay down to Cape Arago. 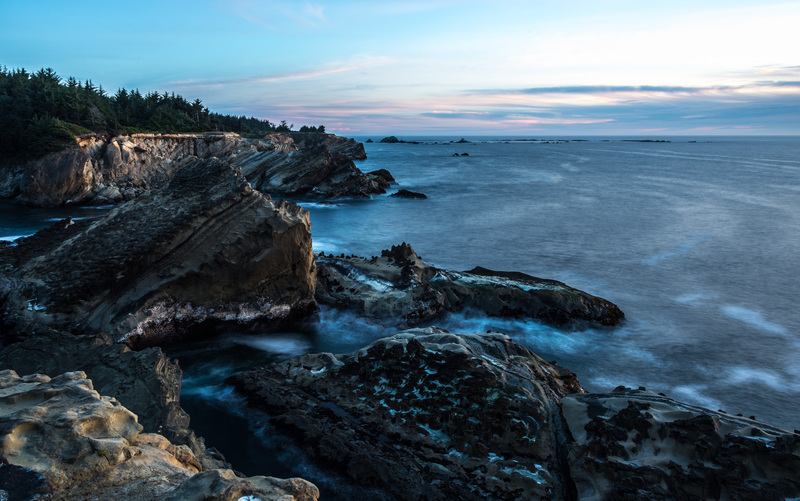 There are five separate state parks in about a seven mile span along this route, each more fascinating than the last! 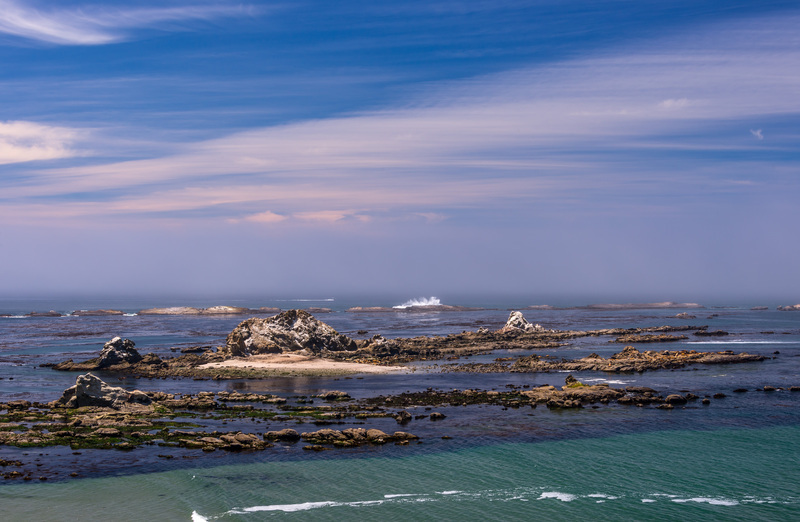 The photo spends most of its time showing you the half mile of shoreline between my shooting position and the lighthouse. Wait until you see more of this area of the coast in the coming posts! 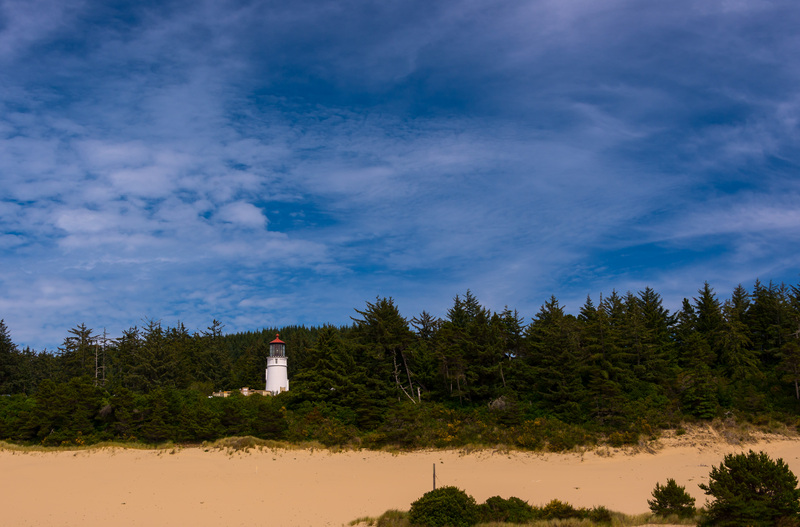 The final lighthouse picture for you is from near our second-most favorite spot to visit from our new park in Winchester Bay….north, on the way back from Cape Perpetua. 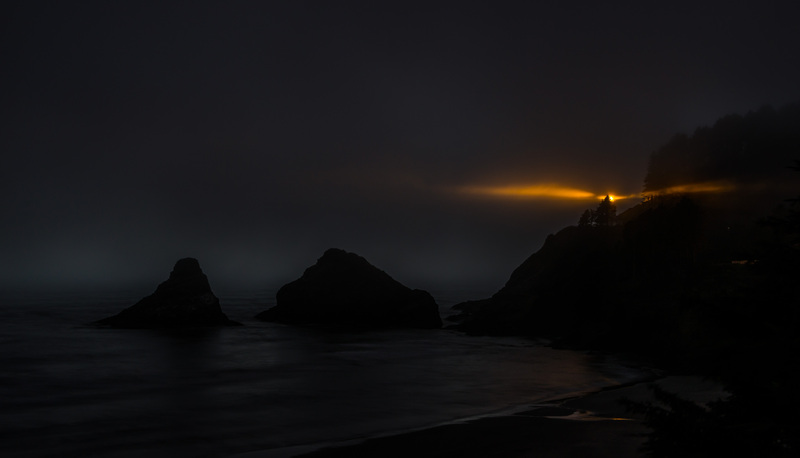 This is actually the same lighthouse that was the first picture in the preceding post: Heceta Head Lighthouse.